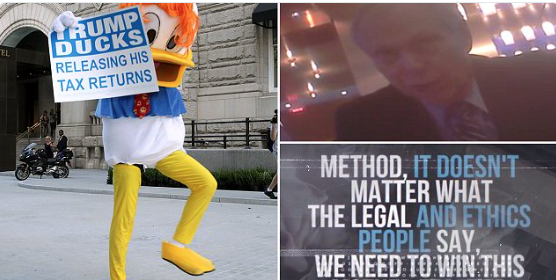 Remember the Donald Duck protesters? Apparently Hillary herself signed off on that…. Part III of the undercover Project Veritas Action investigation dives further into the back room dealings of Democratic politics. It exposes prohibited communications between Hillary Clinton’s campaign, the DNC and the non-profit organization Americans United for Change. And, it’s all disguised as a duck. The first video explained the dark secrets and the hidden connections and organizations the Clinton campaign uses to incite violence at Trump rallies. The second video exposed a diabolical step-by-step voter fraud strategy discussed by top Democratic operatives and showed one key operative admitting that the Democrats have been rigging elections for fifty years. This latest video takes this investigation even further. 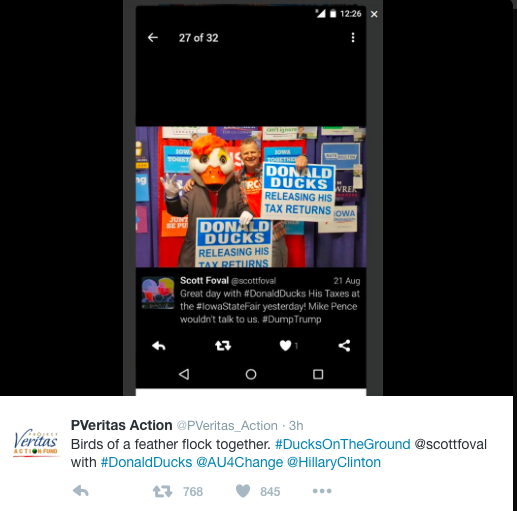 Scott Foval, one of the organizers behind the dirty tricks, even posed with one of the Ducks, further confirming his involvement and the truth of the O’Keefe videos.